The New Balance Hubway bike sharing program re-launches in Boston tomorrow. Sixty percent of the stations will open, with the remainder scheduled to offer bike rentals by April 1. Hubway opened last July and had a busy first season with 3,650 cyclists signed up as annual members. The system, which is partially funded by the Federal Transit Administration, is operated by Alta Bike Share in partnership with Boston Bikes, an initiative of the City of Boston. Cyclists can join as annual members for $85 per year or use the system as casual members and pay $12 for 3 days or $5 for 24 hours. The first 30 minutes of each ride is included in the cost, with riders paying for additional time based on their membership plan. The schedule for opening bike rental stations could be delayed depending on weather conditions. 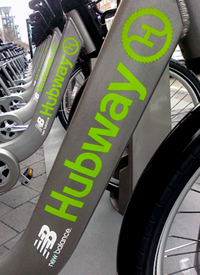 Hubway recommends cyclists visit the Station Map page of its website to monitor progress, follow the program on Facebook or Twitter or download its free Spotcycle application to their smart phone. Wear a helmet. Protect yourself from sustaining injuries in bicycle accidents. Your purchase agreement with the Hubway program also requires it. Riders can purchase helmets when they register for the program. Helmets may also be available at some stations and the program has arranged for a number of local retailers to offer helmets at a discounted price of $7.99. Cyclists should generally ride to the right of traffic, on the right side of the road. Bicyclists may also operate in bike lanes where available and in the center of the lane. Up to two bicyclists may travel abreast in the same lane. Cyclists are not permitted to ride on sidewalks in business districts and many areas of Boston. Cyclists should never ride against traffic. They have to stop at red lights and stop signs just like motor vehicle traffic. Watch your speed! Drivers should travel at the speed limit or slower when conditions involving other vehicles, cyclists or pedestrians warrant it. Unless posted otherwise, state law requires drivers to travel at 30 mph in thickly settled or business districts and 40 mph outside of these areas. Drivers should take caution turning to avoid bike accidents. Drivers who are turning left must yield the right of way to cyclists. Drivers should look before they exit a parked car so as not to injure or impede the travel of a passing cyclist. This is illegal, can cause bicycle accidents and carries a fine of up to $100. Drivers must have adequate room to pass a cyclist. They must also have enough space before returning back to the lane.